With highly bioavailable magnesium blend Magnachel™ and nutrients to support energy production. Ultra Muscleze® Energy provides a high dose of magnesium, a mineral necessary for the healthy functioning of muscles and the nervous system. Magnesium may support energy production and aid in the relief of muscular cramps and spasms when dietary intake is inadequate. Includes vitamins B1, B2, B3, B5, B6, B12, C and CoQ10 which support energy levels. Ultra Muscleze® Energy contains a highly bioavailable form of magnesium from Albion TRAACS® material. Ultra Muscleze® Energy contains vitamins and nutrients that support energy production and reduce tiredness and fatigue. 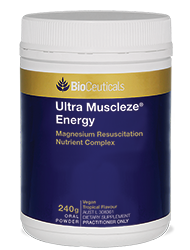 Magnesium in Ultra Muscleze® Energy supports muscle function and helps to relieve muscle cramps and spasms when dietary intake is inadequate. Ultra Muscleze® Energy contains nutrients that support nervous system function. Selenium, zinc and Coenzyme Q10 (CoQ10) in Ultra Muscleze® Energy are antioxidants that help to reduce free radical damage to body cells. Magnesium and vitamins B1, B2, B3, B5, B6, B12, C and CoQ10 support energy levels. Adults: Mix one 8g dose (2 level scoops) into 100-200mL of water or juice. Consume once or twice daily, or as directed by your healthcare practitioner. WARNING – this product contains pyridoxine hydrochloride (vitamin B6) – stop taking this medication if you experience tingling, burning or numbness and see your healthcare practitioner as soon as possible. Contains ribose which is a sugar.